Abstract: Literary neologisms differ markedly from those of everyday language, since the affectivity which is imbued into literary texts is absent in other types of writing. Although literature is another point where neology can be evaluated, linguistics has long neglected literary neologisms, simply classifying them as anomalies. Since literary neologisms play a sociological and affective role, they cannot be studied without going beyond the bounds of linguistics. They need to be studied in conjunction with other disciplines, such as sociology, literary criticism, pragmatics, psychiatry/ psychology and so on. In accordance with this interdisciplinary approach then, the author has drawn on theories developed in psychoanalysis and psychiatry. On the one hand, linguistics needs psychoanalysis to explore authors’ subconscious, and psychoanalysis needs linguistics, as it manifests itself in language. On the other hand, literary need linguistics to understand associated anomalies of language, whereas linguistics and psychoanalysis need literature to shed light on certain aspects of the human being, which are only accessible through literature. That being said, the aim of the author is to show how literary neologisms can provide insight into the subconscious. The language used by the writer Hélène Cixous, with its extremely rich vocabulary, in particular in its lexical creativity, provides an ideal case study of how the affectivity projected into the neologisms is a reflection of the extreme language and the driving forces experienced by the writer. By drawing on the methods used in linguistics and psychoanalysis, a parallel can be drawn between neologisms in literature and those produced by the mentally ill, thus explaining her reputation of délirade, or excess of delirium. Psychoanalytical theory posits neologisms as coming from the subconscious; however certain criteria, as will be seen, weaken this hypothesis. By working on the text of alterity the subconscious of the writer may be explored, as it is crystallized in neologisms. 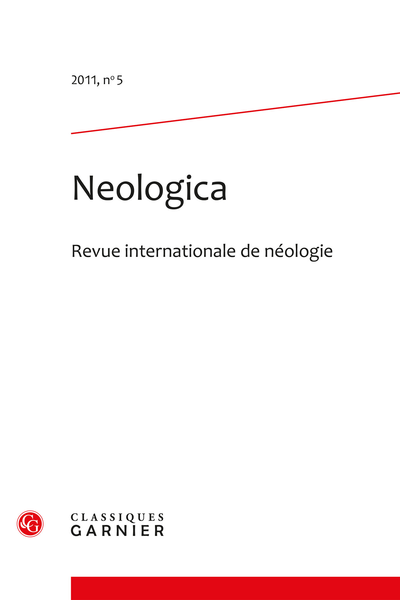 Finally a semantic and formal analysis of Hélène Cixous’ neologism will help to come closer to bringing out what is particular in literary neology.